Have you seen the Netflix series Stranger Things? It is one of my faaaaaavorites! 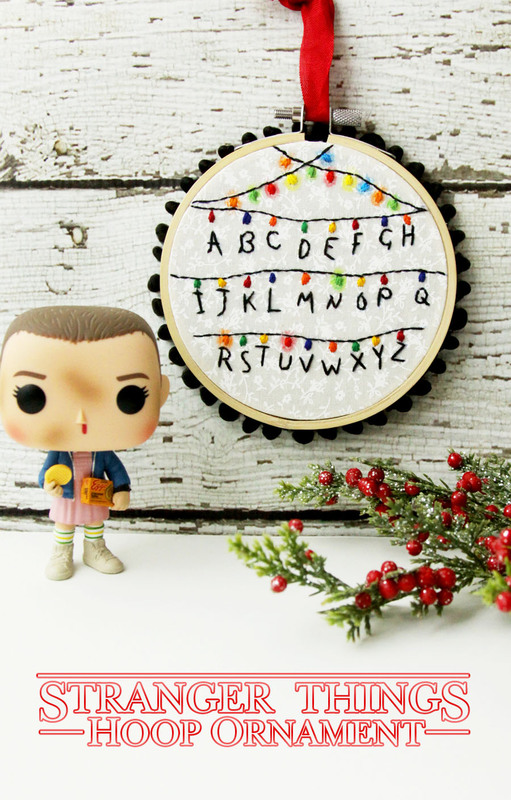 I couldn’t let the flurry of ornament making I’ve been doing end without making a Stranger Things hoop ornament to show off my love for the show. 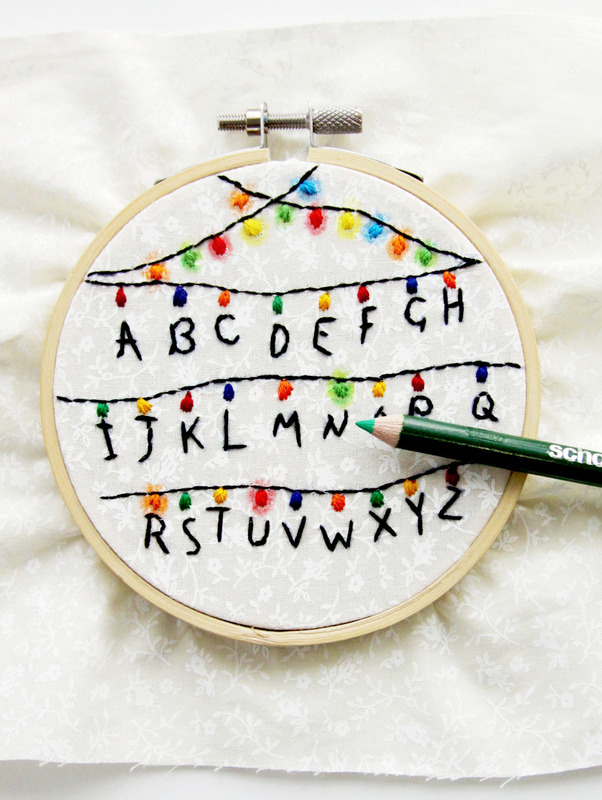 If you haven’t seen the show, one of the characters is stuck in a scary place that he can’t get out of so he ends up communicating with his Mom through some Christmas lights hung on the wall with letters painted under them. Like you do. 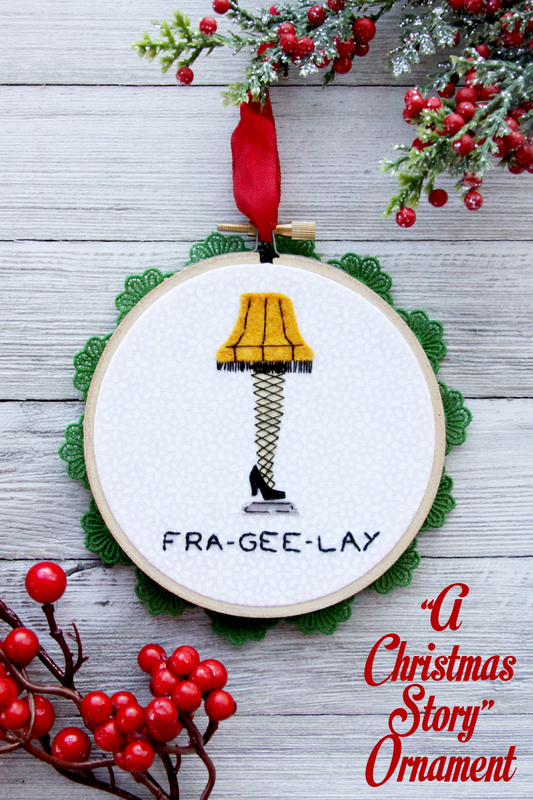 It’s one of the best episodes in season 1 and I thought it would be perfect for a little hoop ornament! This ornament has the message Will sent to his mom – can you see it? I wanted the Christmas lights that were lit to have a “glow” to them so I colored around them with colored pencils. They were super easy to do! I have the two crisscrossed light strands lit and then a few light letters lit – can you see which ones? 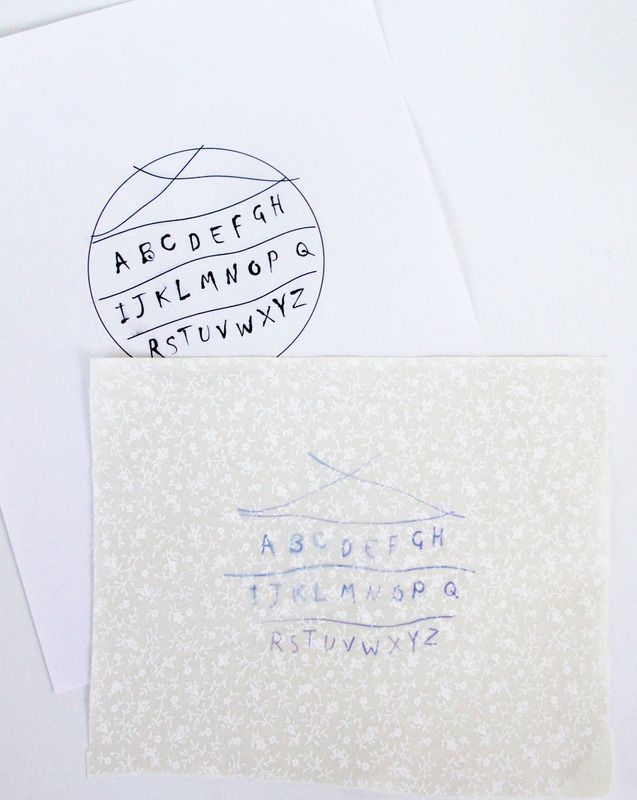 It’s a really simple hoop to stitch – you want to have messy letters and curvy lines. :) It goes together really quickly too – so let’s get started!! Begin by transferring your pattern to the fabric. I didn’t transfer the light bulbs but you can draw those in if you like. 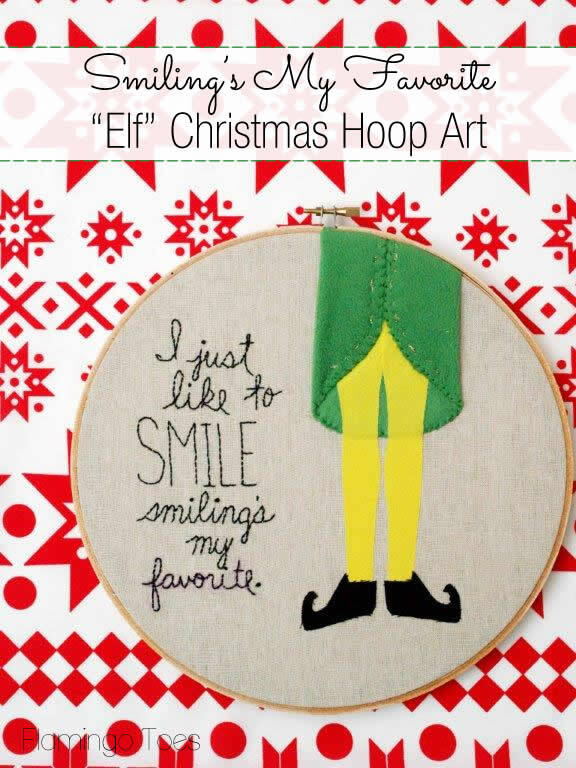 Place your design in a 4″ hoop and embroider the hoop. 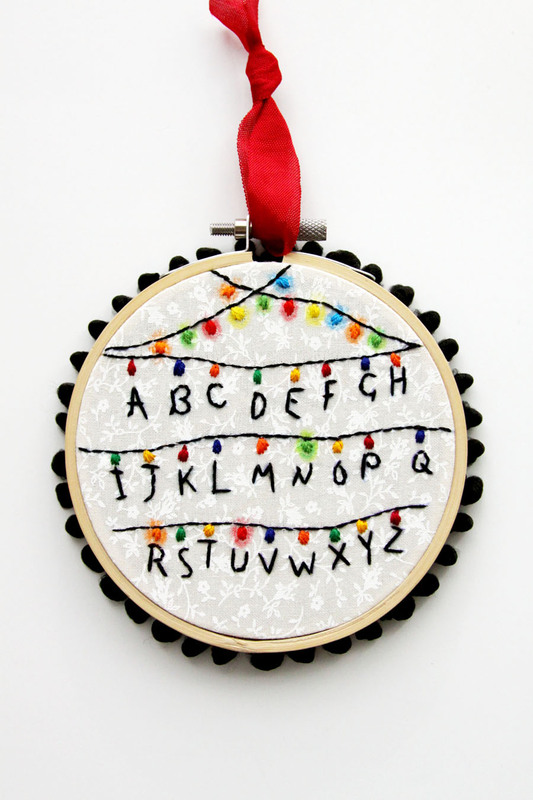 Use a back stitch with black floss for the light strands and letters. Keep your letters uneven like the pattern so they have a paint brush look to them. Embroider the light bulbs with the colored floss. I will confess – I used lighter versions of the colored bulbs that I wanted to look lit up, but I don’t think you need to do that. The colored pencils will give it that effect without changing floss colors. Decide what light bulbs you’d like to light up. 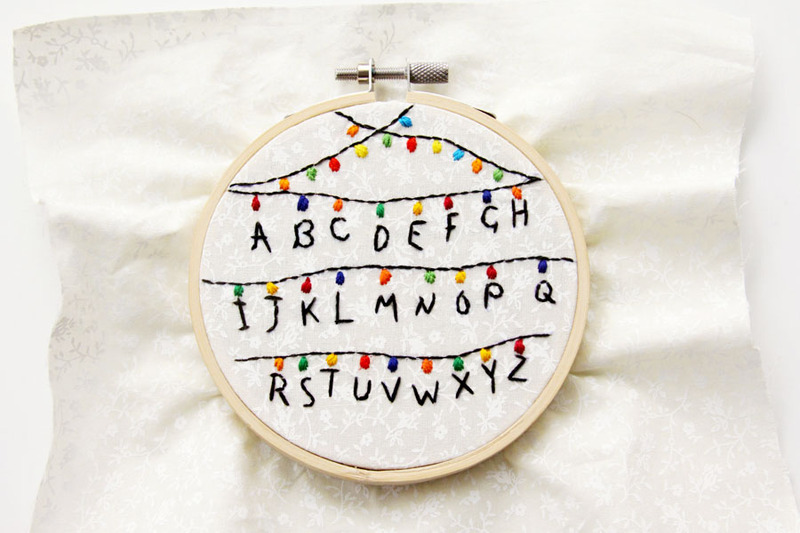 I colored the top two crisscrossed strands and the lights above the letters R – U – N. Color a small circle of color around the light bulb stitching to give it the effect that it glows. Finish the back of the hoop by trimming the fabric to 1/2″ around the edge. Hot glue the fabric to the inside back of the wood hoop. Glue your trim around the back edge of the hoop and finish the back by gluing a 4″ circle to the back of the hoop. Add a length of ribbon for hanging the ornament. 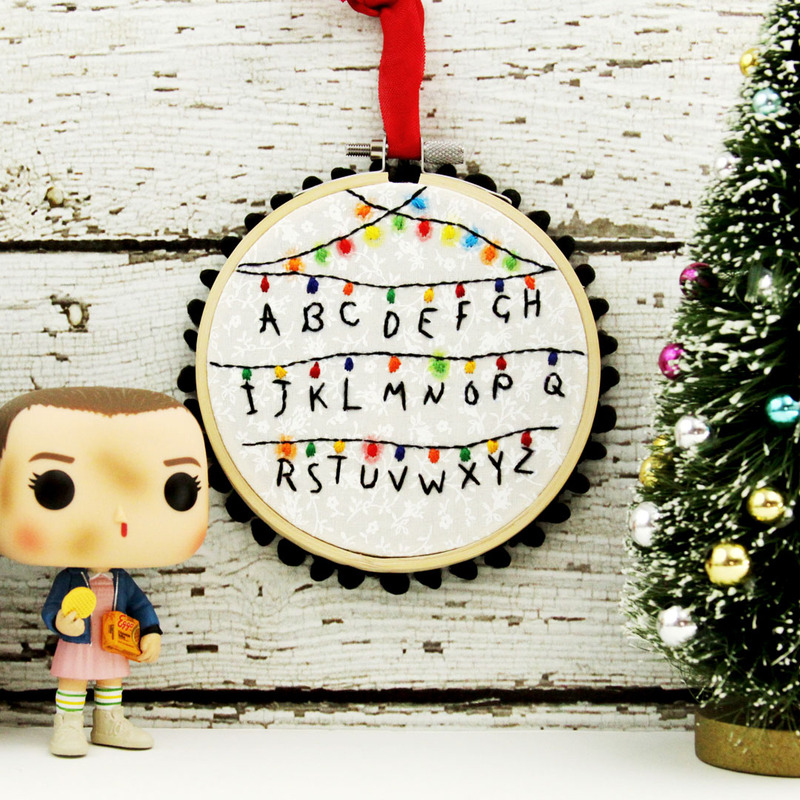 Now you can show off your love for all things Stranger Things! Wouldn’t this be a fun gift for a friend too?! I love this Hoop. 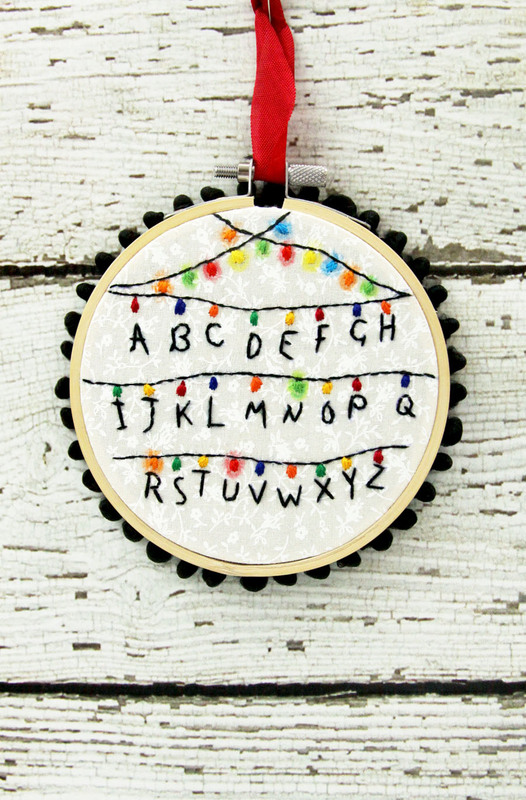 Thanks for the Stranger Things alphabet lights pattern. It looks beautiful. At home we are obsessed with the show, my daughter, especially. We love all the main characters – including the adults – for different reasons. They are amazing, funny, witty, caring, responsible, and endearing even with the bickering moments between shows of loyalty, respect, and love. 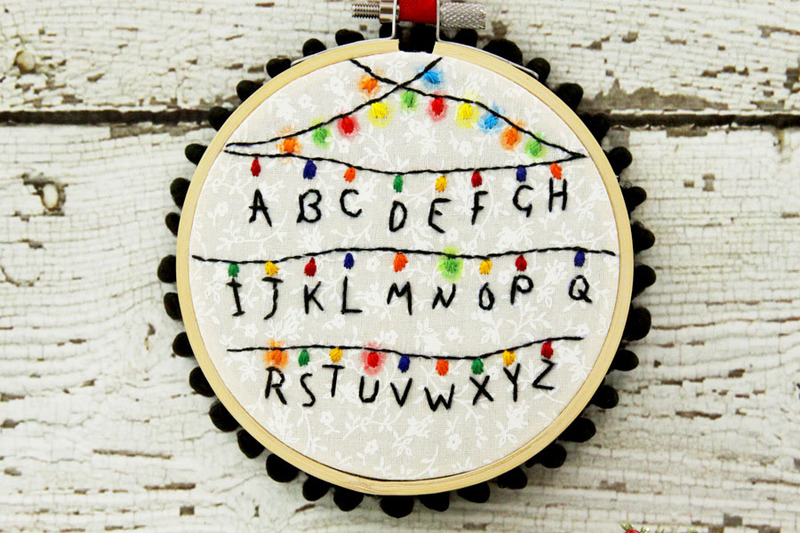 We might use the alphabet lights pattern for other crafts in the house too, like a little wall painting, if you don’t mind? I binge watched Stranger Things as soon as season 2 came out…lol. Love that show and this ornament! 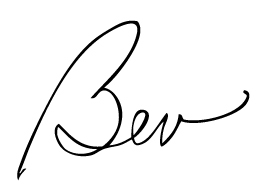 Oh Bev, you have just climbed several notches on the “Awesome Meter”. Thank you for this very cool project. My kids will think I’m so great. LOL! Ooooh!!! I can’t remember the last time I was this excited over an ornament! Can not wait to make one. 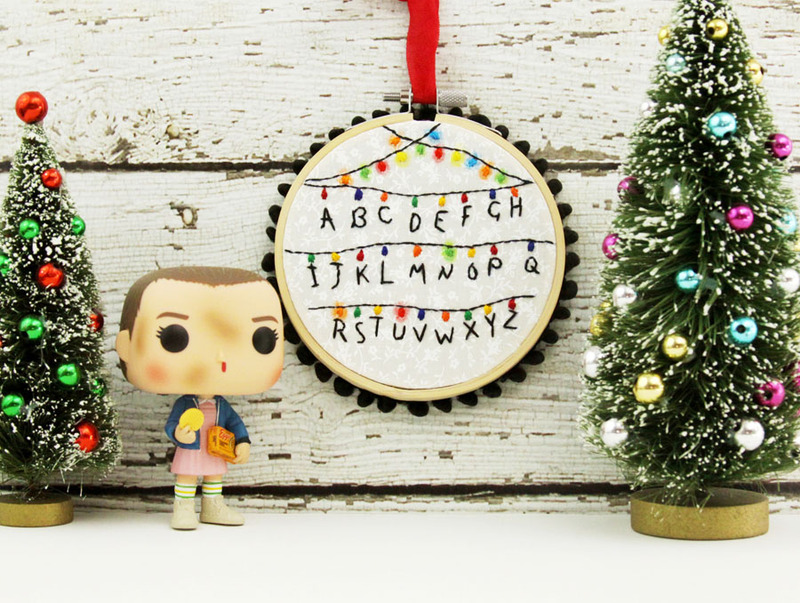 I’m sure my family will understand when I skip cookie baking this year & create a Stranger Things ornament instead. 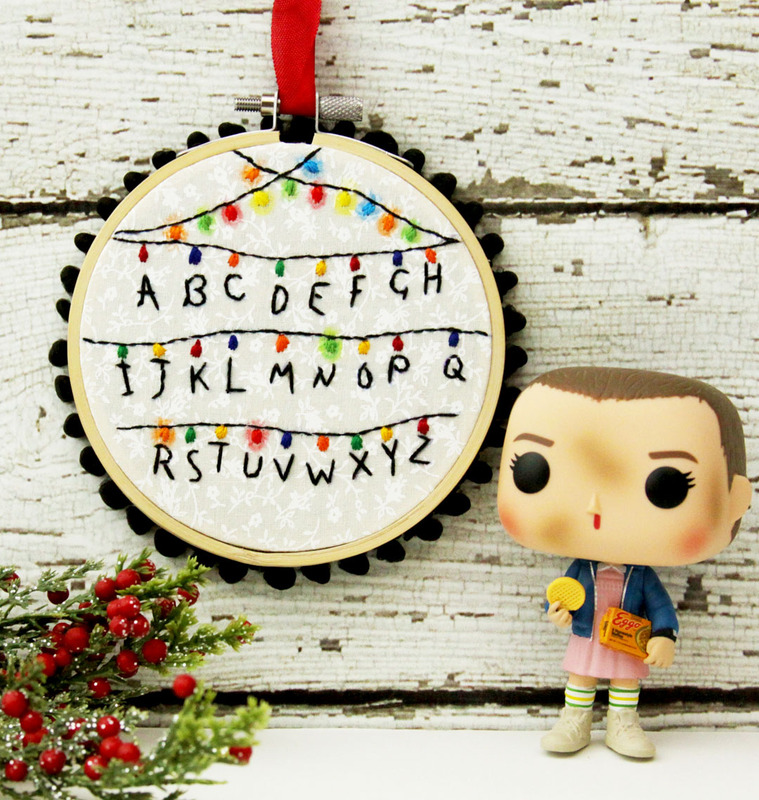 I love the ornament and the show! My husband and I binge watched Season 1 & 2 after it came out! I think my favorite actor would be “toothless”. (I can’t remember his real name and he has teeth now)! I hope the writers can keep up the excitement and don’t lose it! Anyway, the ornament will always remind us of how exciting the first season was, good job! Ohemgee I love this! Joyce & Eleven are my faves. The whole cast is great. Love that they brought Sean Astin in, he Rocks!